March 4, 1877: The microphone was created for telephone communications by inventor Emile Berliner. Bell telephone later purchased the patent from Berliner for $50,000. 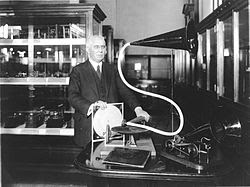 Berliner was awarded his patent for his "gramophone" which recorded sound on cylinders. This same method was used by Edison. Berliner later invented a method to record sound on discs which he marketed to toy companies.